Summer rentals must begin or end on Saturdays. One of the premier vacation locations in South Haven. This condo truly has it all! 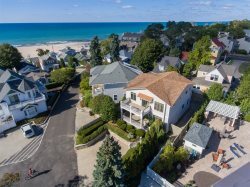 With sweeping views of Lake Michigan along with the pier and lighthouse, semi-private beach, close to downtown & restaurants, small and intimate setting, gorgeous pool, beautiful interiors, patio, and much more. Bedroom 1. Main Floor. King. En Suite Bathroom. Bedroom 2. Main Floor. Queen. Living Room. Aero bed in front closet. Bathroom 1. Main Floor. Shower. En Suite Bedroom 1. Bathroom 2. Main Floor. Tub/Shower. Relaxing, wonderful property with the best equipped kitchen weve ever experienced in a rental!